While it’s still cold and wet, now is a great time to collect all those seed catalogs and gardening books and start thinking of creating or upgrading the landscape around your barn. 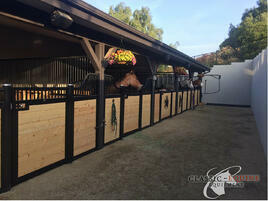 Adding those extra touches around your barn is a great way to turn your facility from practical to perfect. One of the easiest ways to upgrade your stable is with landscaping. Remember that what potential clients see as they approach your barn is their first perception of the kind of facility you run. You may have the best care, footing and feed, but if your barn is looking run down, few will stay long enough to check things out. An appealing entrance doesn’t have to be expensive. Make sure everything looks clean and well-tended. An attractive sign identifying your farm and perhaps a sign indicating the office is always appreciated by people new to your stable. You can also upgrade your entrance with tubs of flowers – ½ wine barrels planted with bright colors (or even your barn colors!) is fine, but using an old muck bucket is a great way to recycle. 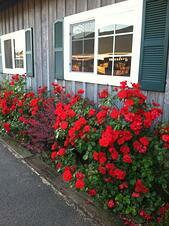 You can also add hanging baskets of flowers at strategic points around the barn. An additional option to make your clients feel welcome is to establish a “relaxation” area with perhaps a picnic table and a few chairs where riders can just hang out. 2. Your landscaping plan is also part of your fire plan. There are numerous plants, including trees and shrubs that look wonderful, but can be deadly to horses. One in particular is the red maple. Beautiful in the summer and stunning in the fall, the fallen leaves of the red maple are extremely toxic. Oleander is another very popular landscaping plant, especially in the south and western U.S., but again is extremely dangerous. Don’t think that your horses are safe because your plants are in planters – more than one escape artist has gotten out of stall just to snack on that tempting looking plant with unhappy results. For a more complete list of toxic plants, click HERE. Use only fire resistant plants – fire resistant does NOT mean fire proof! Fire resistant plants do not readily ignite from a flame. While the plant can be damaged or killed by fire, they do not significantly contribute to a fire’s intensity. Some fire resistant plants, shrubs and trees include: yarrow, coreopsis, coneflower, lavender, salvia, Russian sage, dwarf burning bush, roses (rosa species), Ponderosa pine, and alder, redbud and flowering dogwood trees. Most of these are not only fire resistant, but also drought tolerant and animal safe. If your stalls do not have outside paddocks, you might consider planting small shrubs along the outside of the barn walls for a “softer” look and to help with erosion from rain water. Lavender is a favorite because it is easy to care for and gives off a soothing aroma. However, if you live in an area with high fire danger, it’s best to establish a “defensible space” of at least 50 feet around your barn. This is the area where potential fire-spreading fuel has been modified, reduced or cleared to create a barrier and slow the spread of fire. It also is a space where firefighters can battle the fire safely and efficiently. If you are considering using wood mulch around your landscaping, consider using less flammable types of mulch, such as gravel or decorative rock or a combination of wood mulch and decorative rock (surround islands of bark mulch around plants by larger areas of gravel or rocks). Finally, the best landscaping as well as the best representation of your barn are well kept pastures. Make sure yours are clean of excessive manure and well tended, using rotational grazing practices if possible. Fertilize, aerate and mow your pastures just as you would any landscape. Are you ready for a little remodeling? Check out our products!